I admit to a guilty pleasure: the British soap, "EastEnders". I've been watching it on and off for decades. 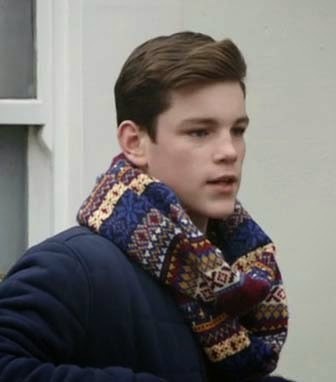 Recently I spotted an interesting scarf on the character of Terry Spraggen, Jr., aka Terry Jr, aka TJ - the son of Bianca's currently-off-again boyfriend. I wonder about its origins. Is it machine or hand-knit? Was it purchased in a store or did someone knit it for him, or maybe he's a knitter? Why not? Maybe it's a fair isle sweater that's been cut down into a scarf. The colors are rich and lovely together. I think I've seen some of these patterns before. I don't think I've ever seen the design that's medium blue on a navy blue background. I'll be watching for the scarf to make an appearance again sometime. I can't be the only one who watches the knitwear in TV shows, can I? Thanks for solving the mystery. Your Mum has good taste! It's a great-looking scarf. If you do find a link I'd be grateful if you let me know too! :) Thanks!